I could never be a teacher. I don’t have the stamina or the patience — and I don’t have enough control over my facial expressions. (It’s probably the eye-roll.) So I have a high regard for good teachers. Having gone to public schools and sent two kids to school, I’ve seen a thing or two go down in the classroom. I’ve been a room parent and school volunteer. I’ve witnessed classrooms in total disarray and classrooms that function like clockwork thanks to a special kind of person who can only be described as a rock star, or maybe a saint! I’m delighted to pay tribute to one such teacher in a new anthology that features me and 38 other authors from around the world sharing everything from heartwarming to hilarious essays about teachers and teaching. It’s called Will Work for Apples, and it released today in ebook and paperback formats. My piece is about a favorite memory from third grade and the fabulous teacher who cheered me to one of my greatest childhood achievements! It’s called A Wagon and A Wink. It’s about jump-roping, persevering, and a little encouragement! Cover Reveal! Take a peek! Ahhhh . . . doesn’t that image make you want to curl your toes in the grass? I’m so excited to share the cover of Barefoot Days, the final novel in my Women of Whitfield small town trilogy! Book three takes readers back to Whitfield and the lives of three women who share a special I’ve-got-your-back friendship. Barefoot Days is Mary’s story. Though final edits are still under way, you can pre-order your digital copy of Barefoot Days now! Release date for both ebook and paperback is April 21, 2017. It’s a Book Birthday sale! September 8, 2016 September 8, 2016 darlenedeluca Books, Uncategorized, What's New	birthday, Books, ebook, excerpt, Sale! Hard to believe it’s been a year since my newest contemporary romance novel hit the shelves (or cyber shelves)! Her Greatest Risk has all the elements you’d expect in a romance novel — interesting characters, (including the hunky hero, Michael), conflict and tension, and a healthy dose of attraction. It’s almost love at first sight, but . . .
On wobbly legs, she made her way back to the stairs. Looking past Michael, Jennifer smiled. She stopped shy of his reach, but he moved toward her, hand extended. He took her hand in his, then leaned down to sear her cheek with a kiss. Her face burned as if she’d been branded. Ignoring Michael as best she could, she moved past him when Sam turned and greeted her. Jennifer graciously shook hands with the entire team, nodded at the audience, and stepped back to the end of the line. Somehow she managed to stay there and endure the long-winded comments – and Michael’s arm brushing against her shoulder. Say thank-you, she screamed inside, willing the lead architect to finish. Just say thank you. Had it been the Academy Awards, the music would’ve started ten minutes ago. Inspiration and affirmation in Palm Springs! So here we are facing down October, and I still can’t get my head around September! It’s been such a flash! A new release, a book fair appearance, a writer’s conference and awards gala, and a trip to see the college kid! It’s all been fun, but I want to pause just a minute and revisit the InD’Scribe Conference and RONE Awards ceremony in Palm Springs. I didn’t meet as many readers as I had hoped for, but the rest of the conference was outstanding. I met so many awesome authors and industry professionals! It was great to meet in real life several people I’ve only had a Facebook relationship with, and put names with faces. The keynote speakers, Catherine Bybee and Anne Perry, were fabulous and inspiring. I found myself wishing I could just get away and write! Ah, but that real life thing . . .
And then there were the RONE Awards. 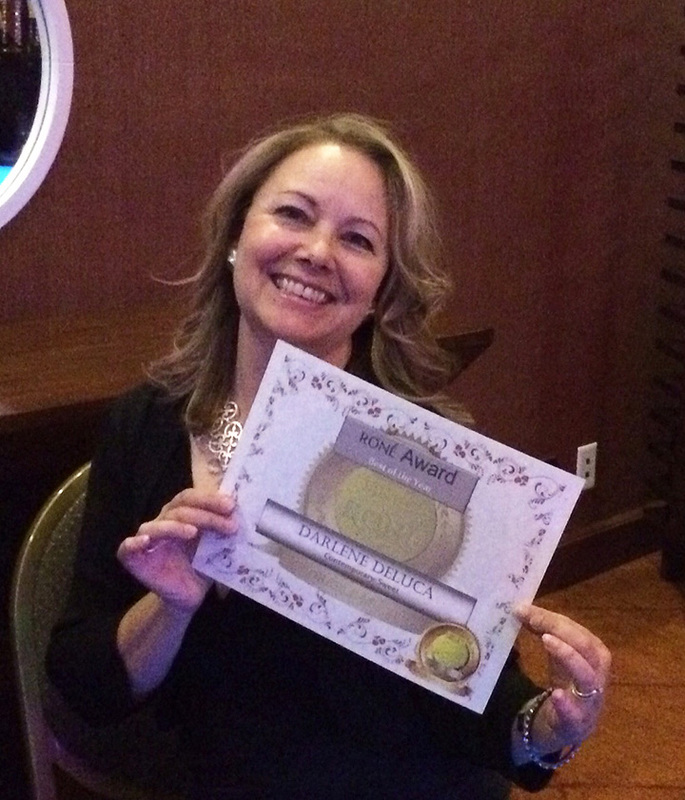 “Something Good,” my finalist in the Sweet Contemporary Romance category, got the first-runner-up spot! Of course it was disappointing not to take home the big prize, but still, simply being there was so affirming! I was among very talented company, and the book was read by four to seven judges who gave it a strong thumbs-up, and that in itself is a wonderful thing! I extended my stay in Palm Springs a day after the conference to settle down and enjoy another day of summer. Great decision! I got to have dinner with a long-time friend from high school who was one of my bridesmaids from thirty-some years ago!! 🙂 Ah, what a three-hour dinner with a good friend can do! I also spent some time at the pool and had fun giving a few leftover books to readers lounging in the sunshine. I gave one gal the choice between my new release Her Greatest Risk or Something Good. She read both covers, and chose Something Good, saying it sounded like a Hallmark Hall of Fame movie. So many people have said that!! I’m wondering if my next visit to southern California should include a stop in Hollywood!? Well, a girl can dream! Happy reading, everyone! Wishing you a lovely Autumn! Click HERE to find Something Good on Amazon! Today’s the day! Here’s the first glimpse of my soon-to-be-released contemporary romance Her Greatest Risk! I love the colors and the large, striking image. Creating the cover for a novel comes with soooo many decisions . . . . colors, mood, font, images, title, etc. I can’t even tell you how many different titles I considered or how many images I looked at before settling on these. Many thanks to Marisa Shor of Cover Me Darling design studio for pulling my concept together! I know many romance books feature couples on the cover — images that convey the author’s idea of what the characters look like. For some reason, I prefer other images. For one thing, it’s really difficult to find stock images or models that exactly fit. Also, as a reader, I like to create the image of the characters in my mind. Every reader may see something a little differently, and I think that’s part of the fun of stepping into a work of fiction. Anyway, here it is! The book will be available in print and digital formats at Amazon beginning Friday, Sept. 11. Stay tuned for more on release deals and giveaways. Happy reading to all! This is always an exciting yet anxious time. I’m getting ready to release a new book – my sixth published novel! 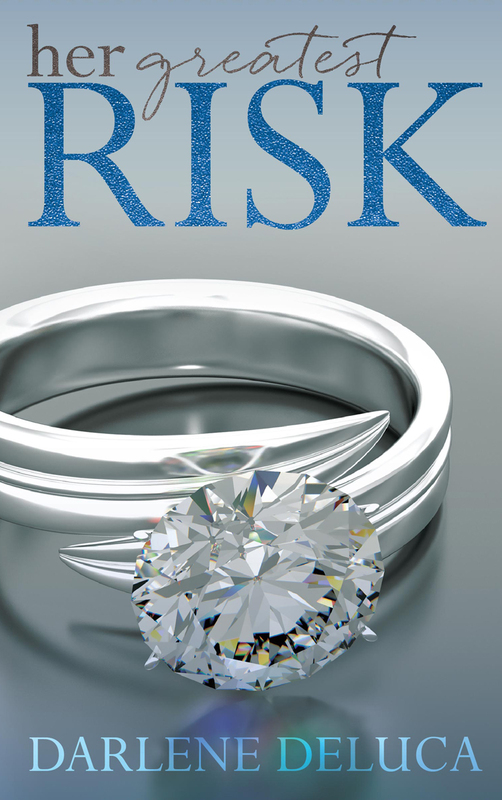 The title, which took forever to decide on, is Her Greatest Risk, and it’s a contemporary romance. Some of my books are more general fiction with romantic elements and have additional story lines. This one is pretty much straight romance with low to medium heat level. Here are a couple of short excerpts. Get your copy soon to read more! Fascinated and shocked at the same time, Michael watched as a woman pushed against the window, shouting fiercely, her face so distorted that it reminded Michael of one of those wavy mirrors at an arcade. Will simply nodded his head as he inched the car forward. People yelled and pounded on the car. Signs blanketed the front of the windshield. He brushed a thumb across her lips, and another thought slammed in. That call. That damned phone call from him. She said she’d call him back later. Would she yet tonight? And what would she say? Michael swallowed hard. It wasn’t something he could ask. All he could do was . . . wait.